According to June Drenning Holmquist’s They Chose Minnesota, Joe Huie came to Duluth from China’s Guangdong Province in 1925 to work for a relative who owned Duluth’s St. Paul Restaurant. Over the next twenty-five years, he would return to his native land many times for different reasons: to retrieve his wife and son, to remarry after his first wife’s death, and to “help the people” of China, who were struggling first with Japan and later with emerging Communism. He moved to Duluth for the last time in 1951 with his two older sons; he opened his café, and two years later the rest of his family followed him to Duluth. In the early 1970s former Vice President Hubert Humphrey visited Duluth; while driving out of town Humphrey saw Joe Huie on the street. He stopped the motorcade, jumped out, gave Huie a hug, and stood talking to him while his aides tried to get the politician back in the car and off to the airport. In 1964, Joe’s elder son Wing Ying Huie opened the Chinese Lantern in the Palladio Building on Superior Street. In 1976, at employee Rose Chida’s suggestion, he moved the Chinese Lantern into the former Duluth Athletic Club at 402 West First Street (originally the Duluth Commercial Club) and also opened the Brass Phoenix Night Club. The many who dined there included Vice President Walter Mondale, Pearl Bailey, and Elvis Presley. A fire in 1994 gutted the restaurant, and it never reopened. Today a Huie family relative runs Duluth’s Chopsticks Inn. 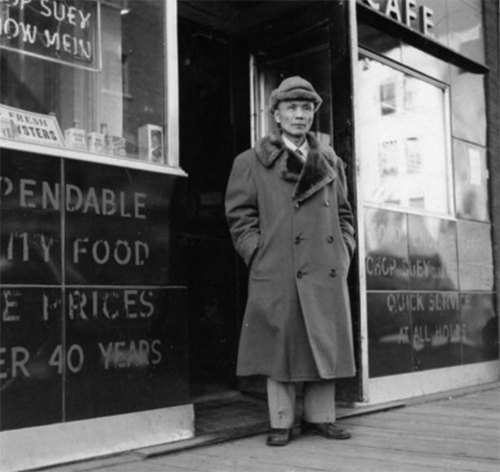 Joe’s youngest son, Wing Young Huie, is a noted Minneapolis photographer.